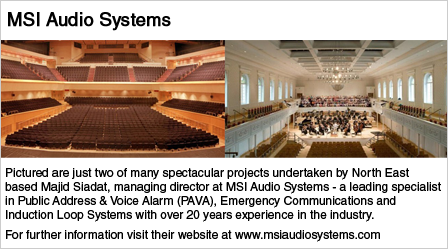 Any architecturally or acoustically demanding building which requires sound or communication systems needs input from experienced audio specialists to ensure the right products and design input are incorporated into a new or upgraded system. The Institute of Sound and Communications Engineers (ISCE) is a specialist learned society and professional body for sound and communications engineers. Founded in 1948, it is an entirely independent Institute, run by a Council elected by its members. Members maintain a code of conduct in professional activities, embodying high ethical standards and concern for the environmental and sociological impacts of professional activities. 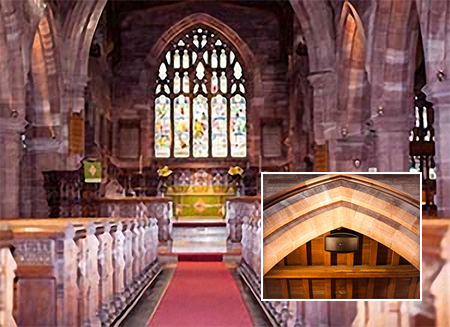 This multi-zone audio system installation was installed by Cheshire based ISCE members Kirkpatrick Sound Engineering at All Saints Church in Daresbury. The whole 'front end' of this system consists of a Symetrix Symnet Cobra programmable digital unit that takes care of microphone switching and sound shaping together with feedback suppression and zone control. SoundTube loudspeakers sit high up in the arches and are almost invisible under normal church lighting conditions. 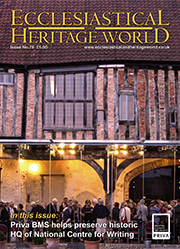 Proprietor Roy Kirkpatrick MinstCSE said: "This was a demanding project to provide a modern flexible multi-area sound system in a church with complex spaces and steeped in historical significance due to its association with the writer Lewis Carroll." Members of the Institute are professionals from the field of audio – especially public address, voice alarm, sound system, audio frequency induction loop system, audio-video or acoustics – who maintain a code of conduct in professional activities. Membership includes consultants, manufacturers and specialist installers who are all able to engage with an end user or their architectural advisors to develop and deliver solutions in even the most demanding of buildings. Contact with members in most areas of the UK is available via its website or the secretariat. As a learned society, the institute is keen to share their knowledge and expertise with others working in the industry and offers a wide and varied programme of training courses for both members and non-members, from beginners to advanced, with the focus of the training on important technical and standards issues. The organisation also arranges an annual event ISCEx, which next year is returning to the picturesque rural location of Coombe Abbey, outside Coventry, and will bring consultants, specifiers, installers and manufacturers together, under one roof. Following the AGM during the afternoon of Tuesday, 7 March with a networking dinner and entertainment in the evening, the exhibition and seminars will take place on Wednesday, 8 March 2017. The Institute runs training courses for both members and non-members, from beginners to advanced, in the sound and AV industry. The ISCE are running the following courses up to the end of 2016; An Introduction to Live Sound Engineering - 6 October, Voice Alarm System Fundamentals - 3 November, Design and Installation of hearing loop systems - 23 November and Measurement and Certification of hearing loop systems - 24 November. The training focuses on important technical, managerial and standards issues. With audio and acoustics specialists from across the country, ISCE members can offer churches an authoritative service in designing, installing and maintaining sound systems in difficult acoustic and demanding architectural buildings. 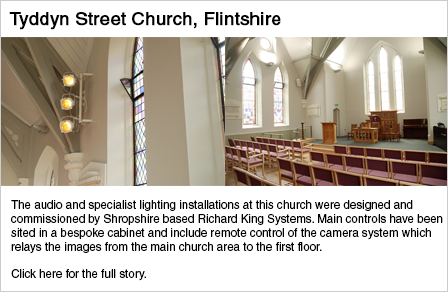 Some church specialist installer members have experience of working in several hundred church buildings of different faiths and can offer a complete service tailored to the needs of worship. ISCE has also created an approved hearing loop assessment scheme to offer organisations a source of competent individuals and companies who can test and assess their hearing loops for correct operation and performance. The importance of having a correctly installed and operational induction loop is vital in this day and age with aging congregations. The latest induction loop equipment coupled to a modern sound system can provide excellent results to those who are hard of hearing. With the recent introduction of many exciting new audio products, many of the traditional problems that churches encounter with sound systems can be reduced and possibly eliminated, such as feedback, poor microphone pickup, lack of intelligibility and ease of use. Digital audio mixers enable systems to be setup during commissioning by the installer with lots of sophisticated control, yet leave the end user with a simple to use system which can revert to default settings in the event of unauthorised adjustment. Loudspeakers with accurate control and dispersion can minimise reflections from hard surfaces and improve the audibility in reverberant spaces. In particular directional columns and steerable arrays can perform in the most demanding of locations. Compact full range speaker enclosures can combine music and speech with hi-fi quality and remain relatively unobtrusive. High sensitivity condenser microphones can provide discrete yet effective pickup from lecterns, pulpits and altars, with many options for mounting, positioning and appearance. Options vary tremendously with different mounting options, heights and finishes. With many budget products flooding the market, choosing the correct radio microphone is important and selecting the ideal one for installation in a church is vital. ISCE members have access to products from many manufacturers, which can be more suited to use in worship applications than some available through retail channels. In particular, the impending sell off of frequencies by the government may impact on a number churches who use radio microphones on certain frequencies. Keeping your existing system regularly maintained, ensures it stays up and running when you need it most. This is particularly important for induction loop systems, which require an annual test. Many systems can be improved with a few simple adjustments and tweaks, which an engineer with a trained ear can provide. 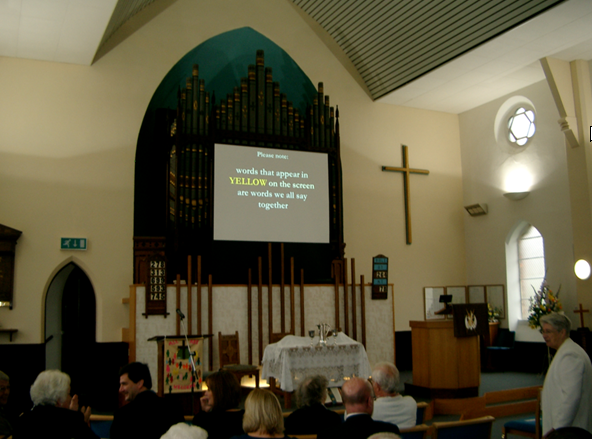 Whatever your churches’ audio requirements, using the professional services of an ISCE member will ensure you take the correct initial steps to obtaining a clear, natural sounding and intelligible church sound system. 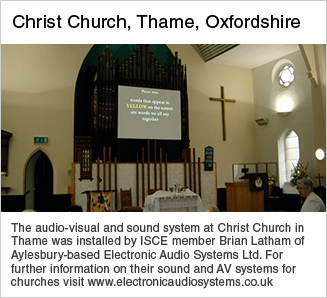 Aylesbury based Electronic Audio Systems Ltd has been in operation since 1988. The company has many years experience in designing, installing and maintaining high quality sound systems to various types of clients, mainly in the London and Home Counties. You can find a selection of ISCE Accredited companies in suitable categories in our directory such as Loop Systems, Sound Systems, Fire Safety, Electrical, Security and Acoustics by searching in your area for the type of company you need. Look for the ISCE Logo.